a feast unto itself, but you can bulk up a meal with sides like char siu mayo don—a mound of rice heaped with more unctuous pork, yuzu-accented mayonnaise and raw sliced scallions. TOTTOlly recommend! See what I did there? Totto Ramen impresses and surprises me. When I think of rich broths I generally associate that term with tonkatsu pork flavors. However, Totto's chicken broth packs just as much flavor as any pork base I've ever tasted. 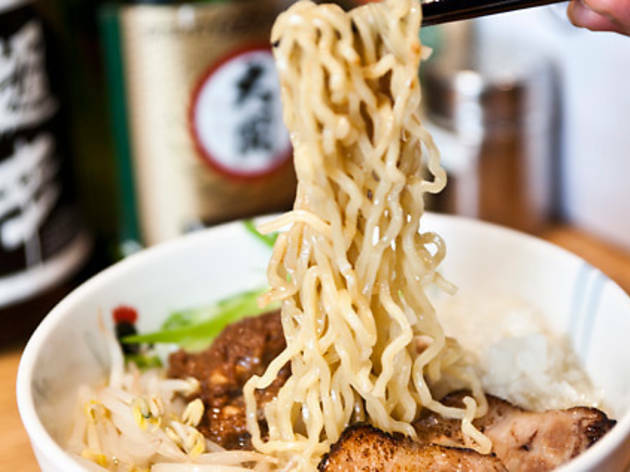 Many ramen joints excel in their noodle dishes and little else. 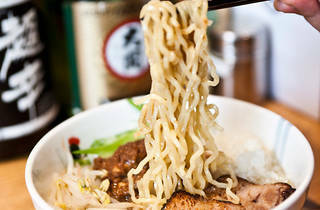 However, guests will be pleased to find all of the other menu items at Totto match the quality of their ramen. I highly recommend the seared tuna sashimi and the uni bowl at the Hell's Kitchen location. Cash only. Countertop as well as table seating. Delicious ramen, made with a creamy chicken stock, made fresh, made to order, served fast. Variety of noodles, toppings, and protein. Super savory, decently priced, and high quality. Even when there's a line it moves fast. Highly recommended. ordered the miso paitan (top) and spicy paitan (bottom) - the broth is a lot thicker than regular ramen, and a little on the salty side. Went here for the fist time recently, and I got the veggie ramen bowl and edemame and it was super tasty! It was a VERY cold night, so a nice hot bowl of Ramen was PERFECT! Got there right around 7 and didn't have to wait, but there was a line when we were leaving. The service is very fast, felt a little rushed, but the soup itself is so hot and tricky to eat that I feel like I spent plenty of time there! The decor is very cute and cozy. Definitely a great winter spot! Visited Totto Ramen on a recent trip to New York. The ramen was great for a late dinner, with a thick tonkatsu broth paired with delicious noodles. I'm not a spice fiend, so the paitan was perfect for me, although next time, I think I'd go for the pork. The OG location of Totto, despite facing a constant 30 min wait, is also the main location you should visit. The small interior, with its wraparound bar seating, beckons to the hole-in-the-wall ramen spots that proliferate Japan. 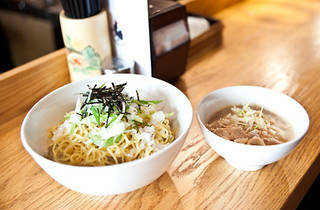 They have a variety of ramen, mostly differing in broth (pork, miso, soysauce, seafood) and protein choices. 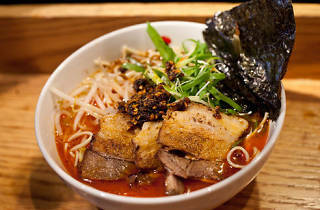 Their signature, the Totto Spicy ramen, is thick, filling, and unabashedly heavy. This is one of the few times where the heavy, oily broth goes perfectly with the lighter meat and noodle pairing. 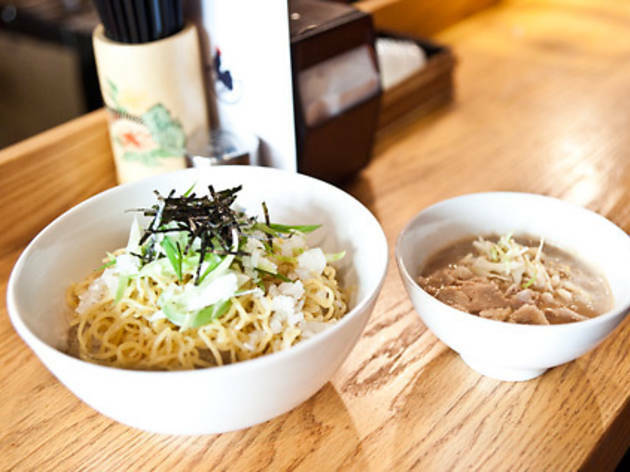 The prices here are also comparable to other ramen spots across the city, so there's no real reason as to why you haven't been yet. Totto Ramen is my favorite ramen place in the city. Their ramen is a chicken based broth which I personally prefer over the more popular tonkatsu broth because it’s much lighter. Spicy Ramen with pork and added corn is my go-to option. My husband and I have also tried pretty much every appetizer on the menu – our favorites being the pork bun and fried chicken. I’ve also had some pretty tasty seasonal raw-fish based appetizers. The 52nd Street is the original location, but they have opened two other locations in the city. Both have much shorter lines. But, hey, it’s all part of the NY experience to wait in the freezing cold for 1.5 hours for Totto! This is a GREAT ramen place. Not the best, but it's 2nd best (if you count Minca and their sister shop as one). Note that there are 3 branches all near each other so don't get confused. This one is on W52nd, then there's one just one block away at W51st! Then there's one more down 52nd on the East side. Confusing, I know. 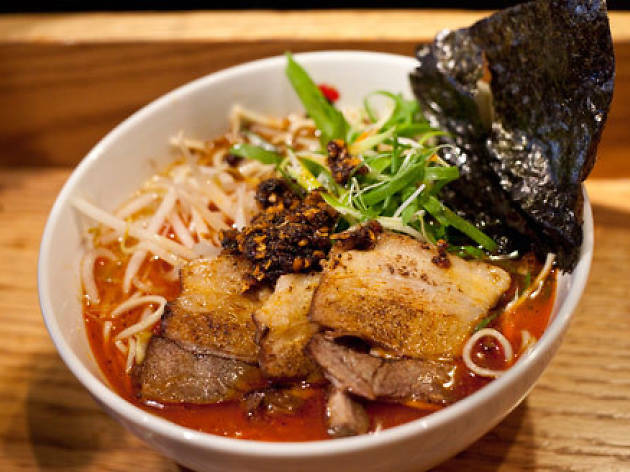 But once you're there you'll be treated to really authentic, thick-sauced ramen. It's a bit peanutbuttery, which isn't everyone's fav, but I LOVE it that way! Totto Ramen is my go-to ramen. I've come here enough that I am allowed to say that this ramen beats other spots hands down. I've had the Spicy Totto and Miso Ramen and I always battle myself every time I go because they're just so good. The broth is so silky and not as salty as the other spots.The pork is blow torched to perfection. The Spicy Totto is actaully not as spicy as you think it'll be but if you can't handle it Miso or Paitan is your go to. The only thing I don't like here is the pork buns - you can get that somewhere else. Another thing that Totto Ramen is that there is always going to be a line. Be prepared to wait about 20 - 30 minutes or more or you can go to their other location on 51 ST.